Truth by Kbaig: Peaceful Resolution of “Kashmir Dispute” is not Only the Duty of UNO but Moral Responsibility of International Community as Well! Peaceful Resolution of “Kashmir Dispute” is not Only the Duty of UNO but Moral Responsibility of International Community as Well! The reminder of Pakistani Prime Minister Nawaz Sharif regarding solution of Kashmir Dispute in 69th Annual Meeting of UNO has created a storm in India. From extremist parties like RSS and BJP to Indian opposition party Congress and Indian media; a wave of anti-Pakistan propaganda had been observed. India has raised a large hue and cry as Pakistan had attacked and captured some part of India. Pakistani PM had only reminded world that there is a historical dispute in UNO that needs to be resolved; which has been cause of various wars between India and Pakistan. Now, when both countries are armed with nuclear weapons; any misadventure or skirmish by India to pressurize Pakistan might lead to dreadful nuclear war. India has several times accepted Kashmir dispute as “Core Issue” between India and Pakistan and realizes that Kashmir Dispute is the reason behind unending tension between both countries. India or Narendra Modi was no expecting that Pakistan would raise Kashmir Dispute on the forum of UNO and that is why when Modi addressed the session in UNO he claimed Kashmir as dispute between two countries that should be resolved under the Simla Agreement. On the one hand India claims Kashmir as a dispute between two countries but on the other hand during negotiations between both countries India wants to discuss bilateral trade only and not ready to discuss Kashmir Dispute. 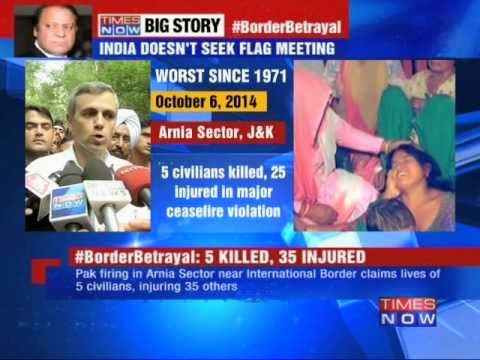 Not only this Modi blamed Pakistan for not showing seriousness to resolve the Kashmir dispute while telling lie Hindu Prime Minister forgot that the scheduled meeting of Foreign Secretaries on 25th August 2014 was cancelled by India. The excuse for cancellation of the meeting was that on 19th August 2014, Pakistani High Commissioner to India met with leaders of Kashmiri Huriyat Conference and this was blamed by India as a conspiracy against Indian integrity and a case was filed against Pakistani High Commissioner. It is a clear fact that India had herself accepted in UNO that Kashmir is not a part of India so leaders of Kashmir Huriyat Conference are not separatists; they just want their right to decide under the UNO resolutions that whether Kashmiri people want to live independent, join India or Pakistan. India is not ready to give Kashmiris their right but she wants to suppress Kashmiri people struggle for their rights through state terrorism and human rights violations of Indian army. India does not respect the “Commitment” given by Nehru on the forum of UNO, in which in response to the resolution in UNO he had promised to give Kashmiri People a chance to decide their fate. Pakistani Prime Minister’s visit to India on the occasion of Oath Taking Ceremony of Modi, ignoring Modi’s anti-Muslim history, extremism and enmity against Pakistan along with refraining from meeting with Kashmiri leadership, was taken by India that Pakistan had stepped down from Kashmir dispute either due to the fear of extremist Indian govt. or being impressed by so called development in India. In fact Pakistani PM’s visit was to end tension between both countries, improving relations between two countries and as a gesture of good wishes to a neighbor. How is this possible that Pakistan steps down from its stance over Kashmir Dispute? This is the mistake of India that she took wrong meaning of Pakistan’s good wishes; afterwards she reacted over meeting of Pakistani High Commissioner with Kashmiri leadership in such a way that she ignored all the diplomatic values and sent a message to the world that India is not ready to live in peace with its neighbors by cancelling Foreign Secretaries Meeting which were to be held after a long delay. Environment was in favor of the negotiations, all the preparations were made and after a long time signs of improvement of relations between both countries have been seen. “Pakistani High Commissioner’s meeting with Kashmiri Leadership was ill-timed and affected Secretary Level Engagements”. Above mentined sentence appeared as Headlines in Indian Media; following Indian media few newspapers and columnists in Pakistan also made it a topic for discussion. NDTV representative baked another hypothesis that discussing Kashmir Dispute in UNO was an attempt by Nawaz Sharif to improve relations between Pakistan army and ruling party. 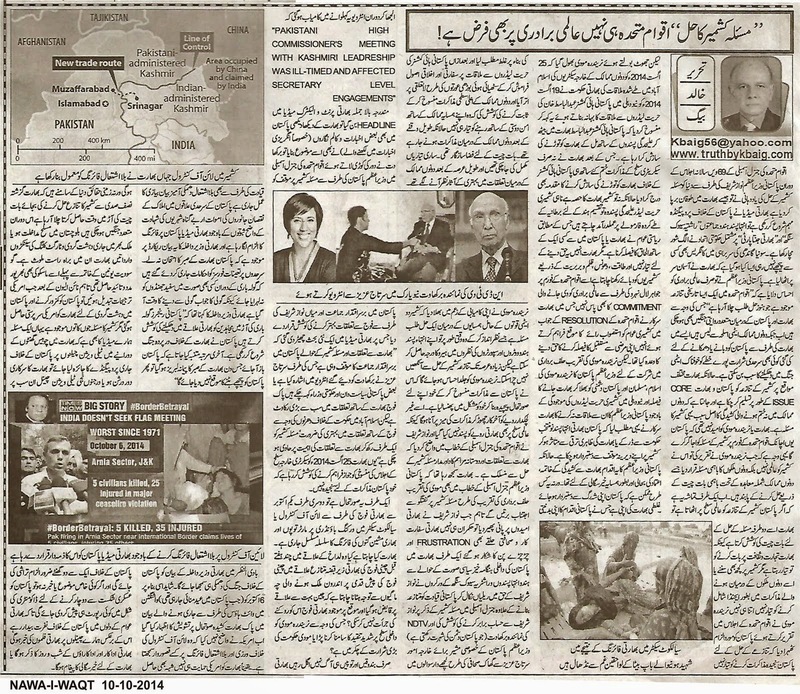 On the basis of this hypothesis a new discussion was started in Indian media that either stance of ruling party of Pakistan is same in which Sartaj Aziz had pointed out or as few Pakistani politicians and Ministers had already said that Pak army is the biggest hurdle in the way of improvement of relations with India. But due to the pressure of protests in Islamabad, Pakistan’s ruling party was forced set aside the will to enhance relations with India by ignoring Kashmir and focus on improvement of relations with Pak Army. Through such propaganda India is trying to blame Pakistan for cancellation Secretary Level meetings scheduled on 25th August 2014. On the other hand Indian army is continuously violation ceasefire over LoC and Workin Boundary by unprovoked firing of Mortar Shells and Heavy Machine Guns. What does India want? Does she wants to divert the attention of Indian public from advance of Chinese troops in Ledakh disputed territory, capture of a vast area and retreat of Indian troops present in the area due to which Modi govt. had to face fierce criticism or India is hatching some big conspiracy or misadventure? Not only the guns are hot but threatening statements are also being issued from Indian side. 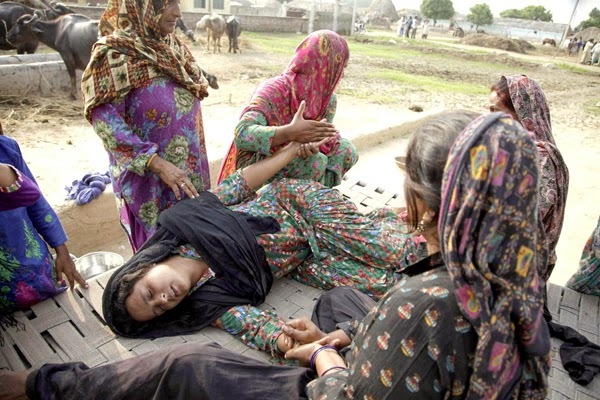 Despite of evidence of loss of human lives, damage to property and deaths of cattle in the Pakistani area adjacent to Indian boundary; Indian propaganda machinery is blaming Pakistan for unprovoked firing. Indian Interior Minister had issued statement that Pakistan should abstain from testing patience of India. Indian forces have been clearly ordered to not to hoist White flags during the shelling because this is the time to fire bullet in response to bullet. Indian Interior Minister blamed that Pakistani Rangers are trying to push Pakistani Mujahedeen into Indian territory under the cover of shelling and Pakistan had started an undercover war against India. If India patience is over then Pakistan will not be given a chance to retreat.